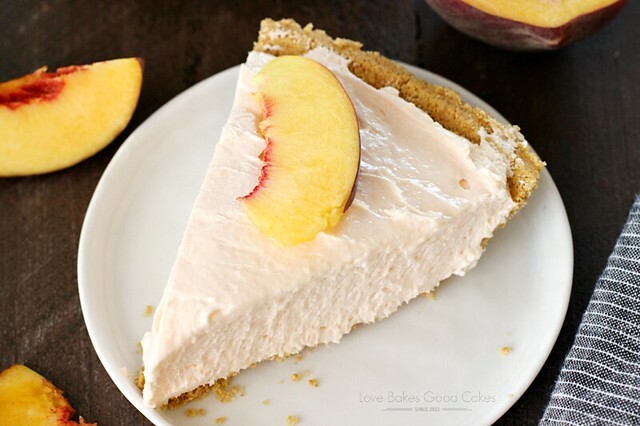 This No-Bake Peach Cheesecake is so quick and easy, not to mention delicious! It’s the perfect treat all year long! I look forward to peach season every year. I’m not gonna lie, I wish it were a longer season. There’s nothing better in the middle of the summer than a fresh, juicy peach! 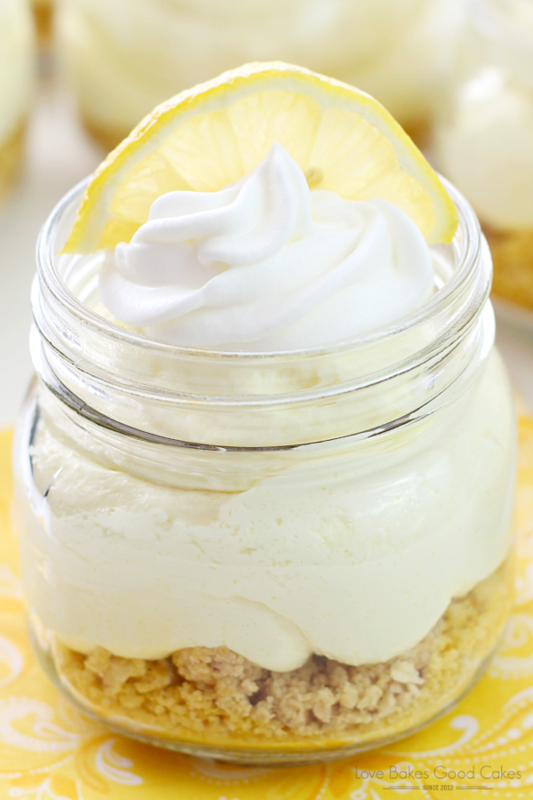 This is one of the easiest dessert recipes ever! 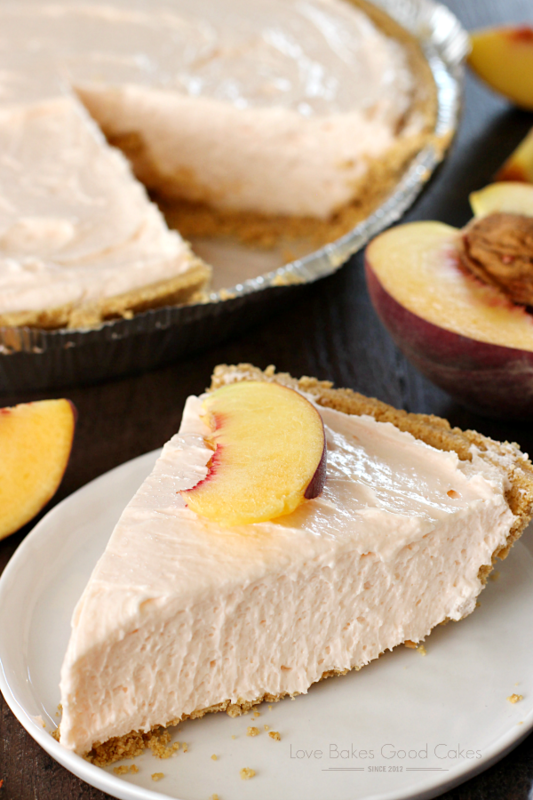 You will only need a few ingredients to make this mouth-watering No-Bake Peach Cheesecake! 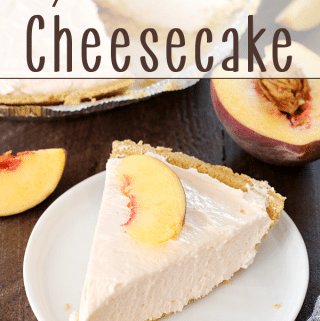 I love taking a few of these babies to potlucks, and we almost always include one of these cheesecake pies in our summer get-togethers! I will also note that you can easily make your own graham cracker crust in a 9×13-inch pan and double the recipe for the cheesecake part to feed a larger crowd. Sometimes, I put graham cracker crumbs in the bottom of a small glass jar and fill the jars with the cheesecake filling. Feel free to adjust the recipe a bit to fit your needs! The pre-made graham cracker crumb crusts work for me because they’re so easy! 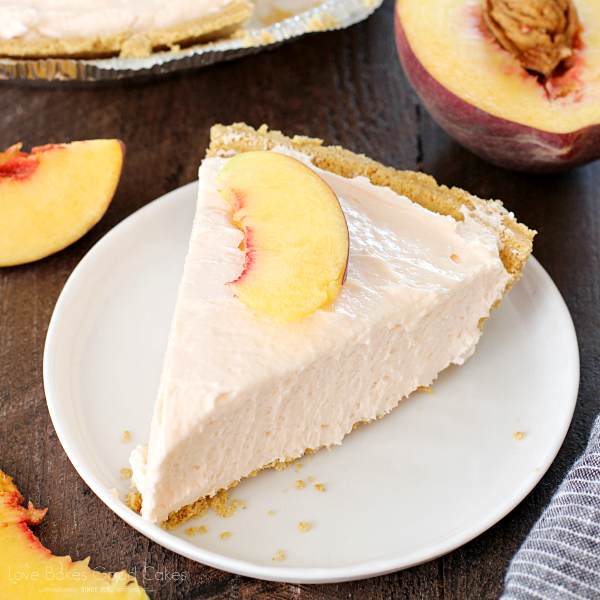 This No-Bake Peach Cheesecake is so quick and easy, not to mention delicious! It's the perfect treat all year long! Place the cream cheese in a large mixing bowl. Mix it well with an electric mixer. Add the sugar, peach gelatin and coffee creamer. Mix well. Add the whipped topping and mix until well combined. Spread the mixture into the pie crust. Cover and refrigerate for at least 2 hours before slicing and serving. 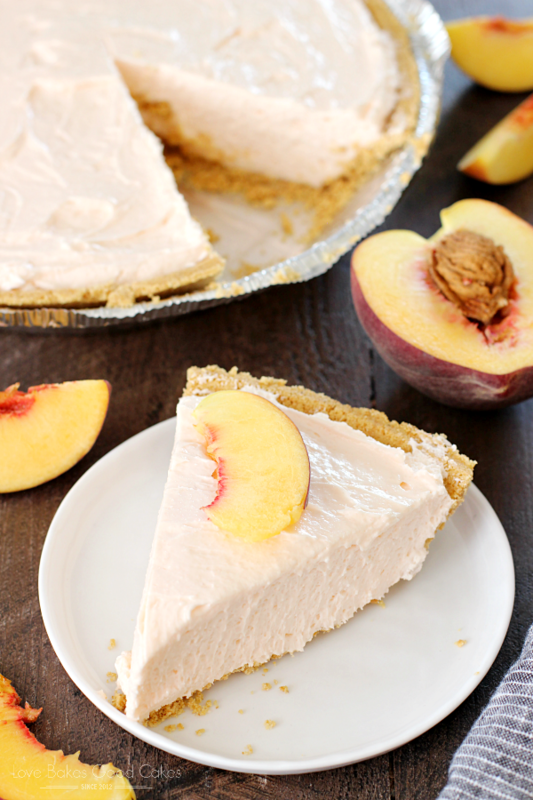 I'm so in to no-bake pies right now. This peach one looks amazing, Jamie! Can't wait to try it! Oh man. If I had one of these right now, it would be dangerous. Pinning this one. (visiting from The Weekend re-Treat) Thanks for sharing! One of my favorite summer fruits, this looks delicious! Hope you are having a great week and thanks so much for sharing with Full Plate Thursday. I'm so excited to try this!! 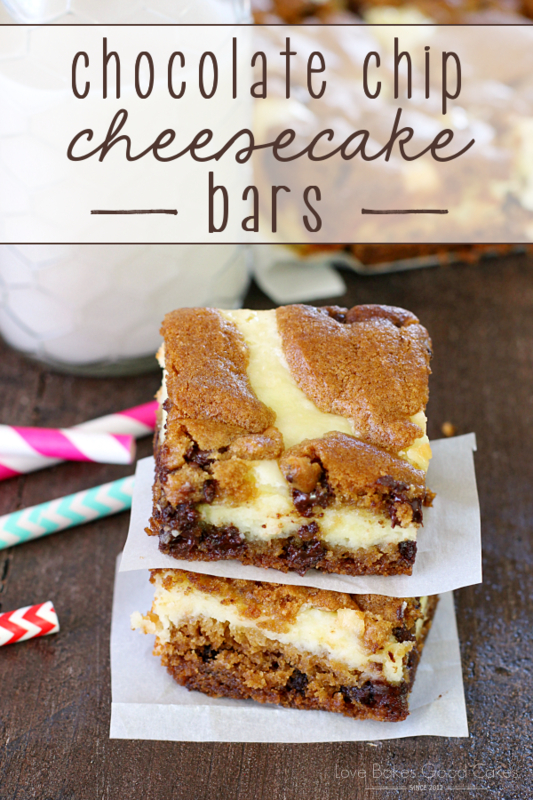 I love no bake cheesecakes and will try this recipe. Have a Happy 4th – I hopped over from Katherine's Corner. Oh wow, this sounds incredible and I love how many flavor choices there are by switching up the jello! Pinned! Oh how yummy this lovely cheesecake looks…and sounds. Printing in hopes to enjoy soon. Thanks for sharing at our Weekend Potluck party. What a great mix of seasonal flavors – love this! This looks SO good! I wish I had the ingredients to make it right now! 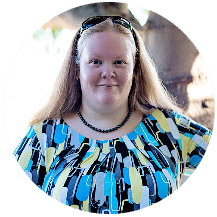 Love how you added the coffee creamer as well – I'm definitely going to try that! 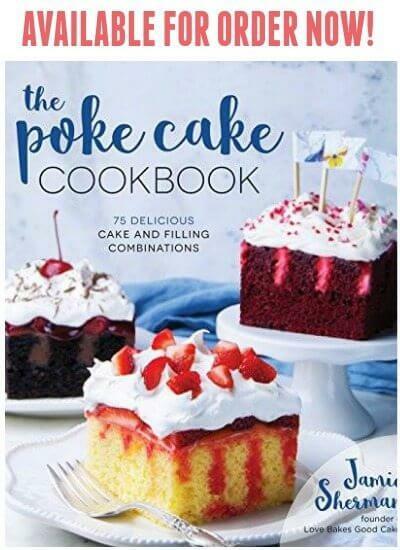 I used to make this years ago and could't find the recipe – thanks SO MUCH for sharing this – I'm pinning immediately !!! 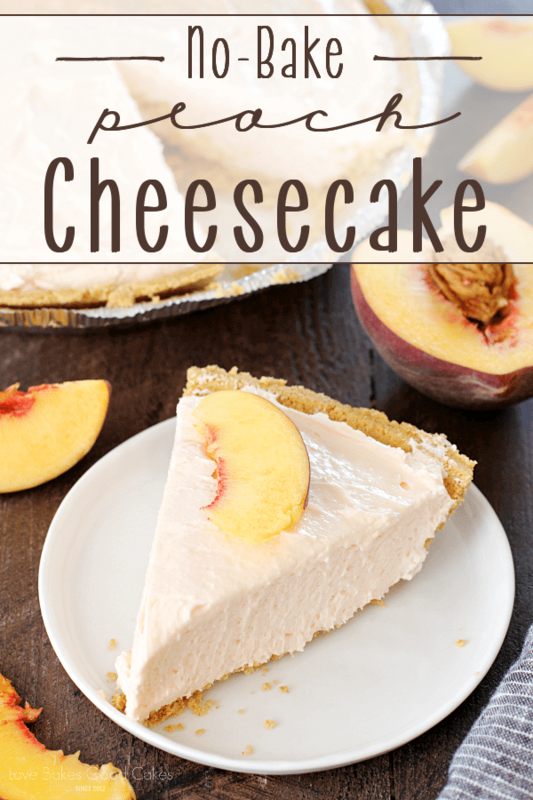 Yummy…I've been on a cheesecake kick (among other things) lately and this fits right in. Pinning it! Hi Jamie this looks so good especially on a hot summer night. Thanks for sharing this recipe and I pinned. Congrats on the feature at Kathe with an E! This looks so simple! Perfect! I Love that this is no bake! Gotta make this soon. I make a 5 min pie it's a no bake all you need is jello any flavor, cool whip,yogurt any flavor and graham cracker crust, make jello according to instructions on box let cool slightly and the yogurt and cool whip mix to incorporate everything pour into crust let set in fridge I like the yogurt with the friut on the bottom. That's it. is there a substitute for the coffee creamer?